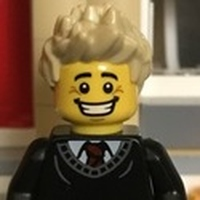 It is about time to add a High School to the LEGO Modular buildings. This 2-story high school was inspired by 1920s-1930s architecture for school buildings. The high school is modeled after a 1930 high school in the first school district in which I taught. The school building is built wider than tall, typical of most schools, and takes up a space equivalent to 2 modular (32x32) baseplates. 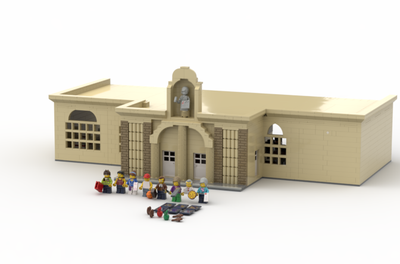 This is created by a space of 48x32 (1-32x32 baseplate & 1-16x32 baseplate) for the school building itself. The other 16x32 baseplate space is created by 2 possible base configurations to meet your LEGO town needs. Specifications on the layout and configurations are below. Corner Building - The 1st configuration is seen in the main picture with a corner courtyard. This includes one 16x32 baseplate to create the courtyard, which includes 2 picnic tables and 2 bicycle racks that can hold up to 4 bicylces. Bicycles are stabilized by a sloped tile piece that fits under the kickstand of the bicycle. A brick built tree finishes off this corner piece. End-of-a-Block - The 2nd configuration is shown as a End-of-a-Block set up with two other modular buildings locking in place behind the school. This includes two 8x32 baseplates to create the wrap around sidewalks. Also, includes a striped school bus loading zone on one of the wrap around sidewalks. Entrance Foyer - Double door entrance, school color rug and 2 wall sconces. 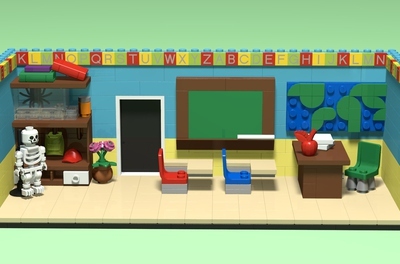 Language Arts Classroom - Contains 6 desks with chairs, 1 teacher's desk with chair, a writing desk, chalkboard, clock, and hanging LEGO Shakespeare quote. History Classroom - Contains 6 desks with chairs, 1 teacher's desk with chair, hanging Gettysburg Address tile, historical shield, chalkboard, clock and historical helmet decoration. 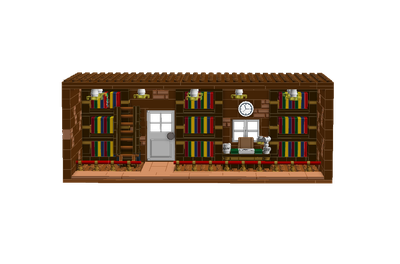 Library - Contains a card catalog, 2 bookcases full of books, 1 table with 4 chairs, librarian's desk with chair, globe, and storage closet located under stairwell. Hallway - U-shaped hallway with 2 sets of lockers leading to 2 rear doors, school bell, and staircase. Science Classroom/Lab - Contains 6 desks with chairs, 1 teacher's desk with chair, lab table with frog dissections, 1 microscope station, chemical vent hood, astronomy poster, clock, fire extinguisher, wall controls for lab, chalkboard, and anatomy skeleton model. Mathematics Classroom - Contains 6 desks with chairs, 1 teacher's desk with chair, chalkboard, clock and whiteboard. Principal's Office - Contains desk with chair, floor lamp, diploma, phone, clock and chair for guest. Restroom - Contains overhead light, toilet and sink. Hallway - Contains an overlooking balcony into the library, 2 sets of lockers, water fountain, and chair outside the principal's office. 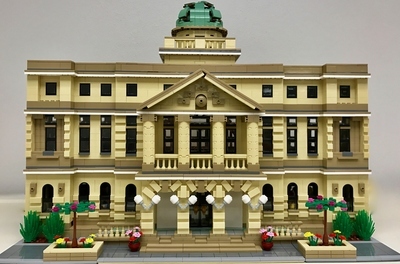 Contains a brick built skylight that slides into place on rails and two micro figure statues. (No roof access for safety reasons.) The skylight overlooks the library. Contain drains, 2-3 lampposts depending on configuration, 1 school flagpole, 2 bicycle racks (corner configuration), brick built tree (corner configuration) and decorative corner tile designs.